Girijananda Chowdhury Institute of Pharmaceutical Science (GIPS), the prestigious pharmaceutical education institute of Azara in Guwahati has become the first PCI approved academic institute to establish a Pradhan Mantri Bharatiya Janaushadhi Pariyojna Kendra (PMBJPK) in its campus . The institute was praised for this noble initiative with an appreciation memento by Mansukh Lal Mandaviya . 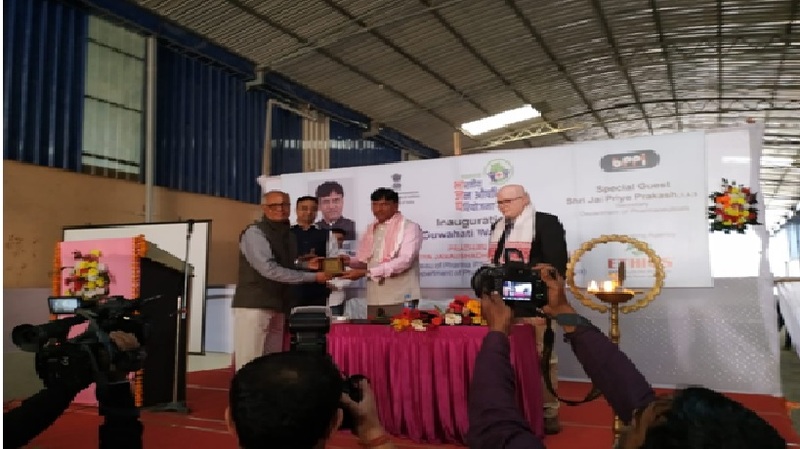 The memento was presented during the inauguration session of Regional Warehouse under Pradhan Mantri Bharatiya Janaushadhi Pariyojona (PMBJP) at Pamohi in Guwahati recently. PMBJP is a campaign launched by the Department of Pharmaceuticals to provide quality medicines at affordable prices to the masses. The outlets constructed under PMBJP scheme sells generic medicines at cheap prices. The medicines sold at PMBJPK outlets are equivalent in quality and efficacy as expensive branded drugs. GIPS is the first non-government pharmacy institute of Assam that was established in 2007.